GREEN BAY, Wisconsin – American Custom Converting (ACC) has launched an updated website that highlights the company’s expanded range of converting, laminating, and other contract production capabilities. 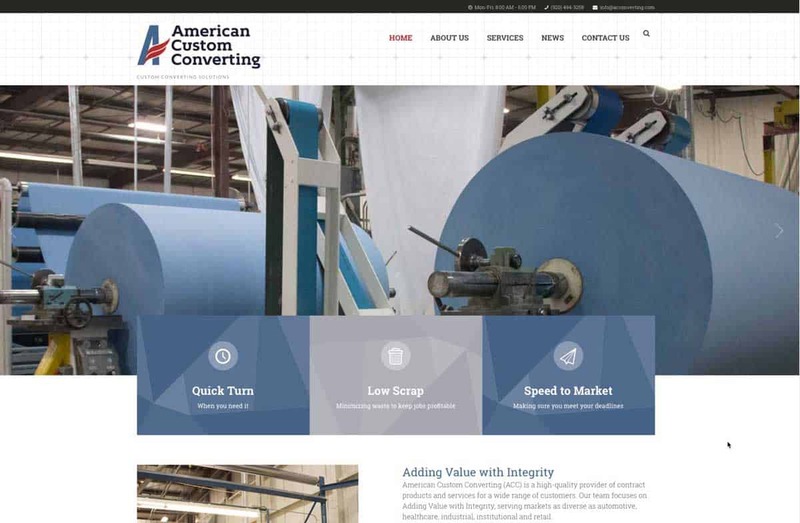 The new site, found at https://www.acconverting.com/, provides an overview of the service lines American Custom Converting offers from its 90,000-square-foot facility in Green Bay, Wisconsin. The company serves markets as diverse as automotive, healthcare, retail, food service, industrial and institutional. ACC recognized that their new laminating capabilities would require a more sophisticated Quality Assurance program so they added a dedicated Quality Assurance Manager to their staff and are working on attaining ISO 9001:2015 certification by early 2017. American Custom Converting is a Green Bay, Wisconsin-based converter of paper, tissue, nonwovens and other substrates, as well as a provider of wide-web hot melt and water-based adhesive lamination services, folding and packaging, lotion coating, and custom machine design and process development services. Founded in 1997, American Custom Converting provides support and stability for customers while creating a positive work environment for employees. Its teams adhere to Current Good Manufacturing Practices (cGMPs), supported by a dedicated Quality Assurance Manager. For more information on American Custom Converting or to request a quote, go to https://www.acconverting.com/ or call 920-494-3258.